In America, the number of stray cats is hardly impacted by the implementation of aggressive trap-and-kill policies. Sadly, most people will not notice one of the authors of this well-publicized piece is the president of the American Bird Conservancy. While there is obvious motivation for a bird advocacy group to publish an anti-cat report, it lends questionable ethics to the study itself, and is especially suspicious considering birds are immune to the rabies virus. 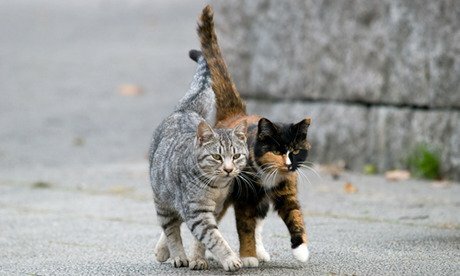 The study completely fails to mention feral cats are wild animals, and the “16 percent of people treated for rabies after being exposed to the virus from cats” are likely primarily unvaccinated pet cats because feral cats are truly wild animals, and are no easier to capture and handle than deer or foxes. Is America’s feral cat problem, truly a problem? For decades, municipalities have been trapping and killing feral cats to try and eliminate colonies of the animals, which under the right circumstances can reproduce quickly. The problem is trapping and killing feral cats has made almost no impact whatsoever on the number of stray cats in this country. If one neighborhood removes a colony of cats, but there is still a regular food supply available (such as rodents, garbage, and dog food), cats from neighboring areas will move in to re-establish the area as their own and restart reproduction. With estimates of around 50 million stray cats in the U.S., the felines will continue to breed while the trapping and killing continues to no avail. Trap-Neuter-Return (TNR) is a more effective method of population control that is now employed in more than 300 communities in America. In addition to spay and neuter, the process also includes vaccination against rabies and, when used properly, stabilizes the number of cats in a certain area. The idea is based on the theory that trap-and-kill has proven ineffective and as long as there are healthy, vaccinated, non-breeding cats in a specific area, they will not permit additional (unvaccinated, unsterilized) cats to enter that area and the populations will naturally decline. The more aggressive the TNR effort, the greater a reduction in overall population. Still, many birders complain feral cats are non-native species and should be exterminated. However, the reality is hundreds of non-native species have taken hold in this country — including Mute Swans, House Sparrows, and Starlings — and killing our way out of the problem with those species has never been a humane or effective solution. So why are cats any different? We know that mass trap-and-kill doesn’t work, why not take the time to recognize what does? TNR saves lives, while reducing populations. It doesn’t get much more humane than that.